Izabela Listowska, Director at Standard hiring a ship) for the dry bulk industry suffers from a signi? cant oversupply of & Poor’s, highlights the implications as An Uncertain Outlook for are at a three-decade low. These have ships. Indeed, overcapacity is running at companies struggle in current conditions International Trade plummeted from a high of US$185,000 around 30%. The global shipping industry faces a Of course, a healthy shipping industry per day in 2008 to US$5,000 today, be- The shipping industry has traditionally number of large challenges in 2016. For depends on sustained international trade. low the break-even operating cost. suffered from poor supply discipline, a start, slower than expected Chinese Yet the economic growth underpin- Meanwhile, container shipping – car- driven by an urge to gain market share in economic growth is having a knock-on ning such trade has been weak in recent rying all non-bulk goods and cargo – has a highly competitive industry. So if ves- effect on international trade, which will years: from 2012-2015, annual global been hit with sluggish growth in devel- sel prices remain relatively low, contain- have a major impact on the industry’s trade growth was at 3.2%, its lowest re- oped markets. The ? 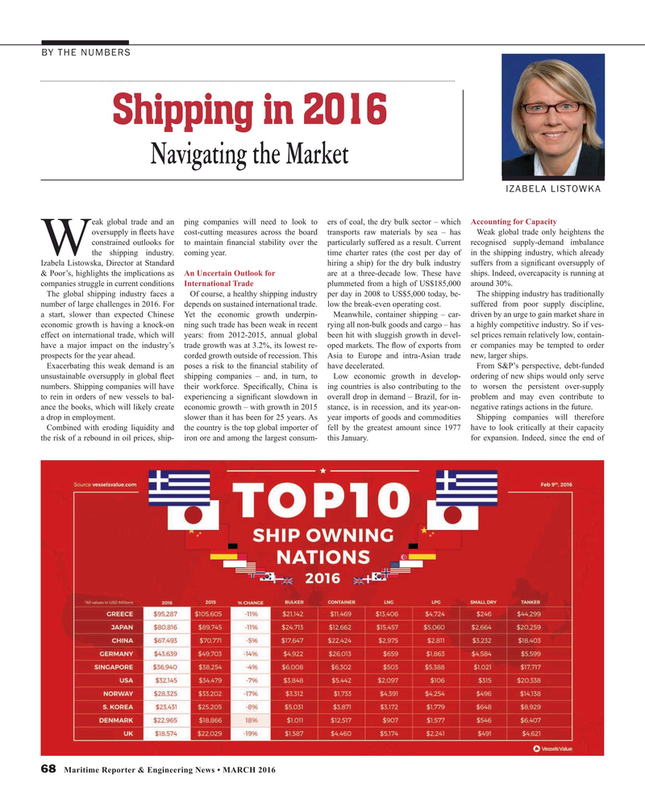 ow of exports from er companies may be tempted to order prospects for the year ahead. corded growth outside of recession. This Asia to Europe and intra-Asian trade new, larger ships.